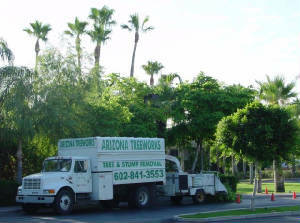 As Arizona’s premier tree service, our goal is to help you maintain the health and beauty of your trees! We will complete your job quickly and efficiently. Our staff is highly skilled in all aspects of technical tree pruning and removals! We maintain a modern fleet of specialized trucks and equipment to ensure quality and productivity! No job is too large! Call us today for Olive Control, we are fully licensed and insured!